XpertMart™ runs on a "platform" created by three other applications: it needs the JRE (Java Runtime Environment) to communicate with your computer, it needs InterBase to store data and it needs InterClient to move information between Java and InterBase. If any of these three programs are not properly installed on your computer, then XpertMart™ cannot run. 1) Begin by testing the JRE. 2) After you've verified that the JRE is installed, test to make sure that InterBase is installed and can read from the database you registered. 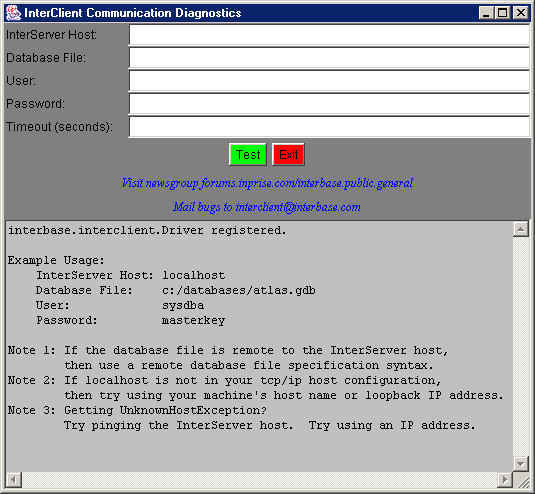 InterBase may be installed but not running. You know InterBase is running if you see this icon in your System Tray. If InterBase was installed but not running, go to the Start Button and find InterBase in the Programs menu and launch it. Make sure you configure InterBase to launch automatically every time you start Windows. InterServer Host: Enter "localhost" unless you are on a network, in which case you need to enter the name of the server you are using. Timeout: Enter "90" as ninety seconds should be more than enough time to run the test. When you are done filling in this information, click <Test>. If the test was successful, you will see the message "No Instalation problems detected" at the bottom of the screen as shown below. If there was a problem, there will be a short error message which should help you locate the problem. If the Communications Diagnostic is successful and you are having a problem launching XpertMart™ you can safely conclude that the problem does not lie in Java, InterBase or InterClient.